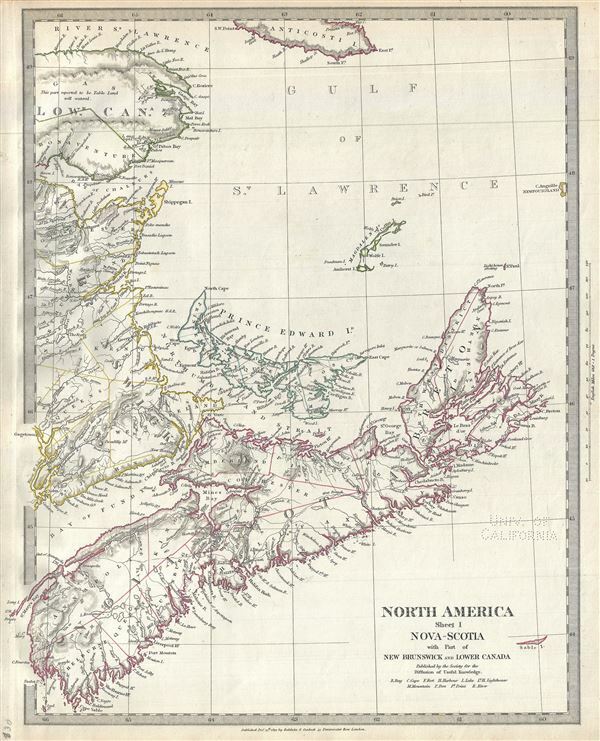 North America Sheet I Nova-Scotia with Part of New Brunswick and Lower Canada. This is a fine 1832 map of Nova Scotia issued by the Society for the Diffusion of Useful Knowledge, or S.D.U.K. It covers the maritime provinces of Canada including the Prince Edward Island and part of New Brunswick and Quebec. Canadian provinces and territories were under British and French control from the 16th century, until France gave up its claims in the Treaty of Paris in 1763. Canada would remain a collection of British colonies until its confederation in 1867, when the British colonies of New Brunswick and Nova Scotia would become Canadian provinces along with Ontario and Quebec. Nova Scotia would become the first British colony to adopt representative government in 1848. Although known as the 'Birthplace of Confederation,' Prince Edward Island would only join the confederation in 1873. This map was originally published by Baldwin and Cradock and is copyrighted in 1832, but was issued in Volume two of Chapman and Hall's 1844 edition of Maps of the Society for the Diffusion of Useful Knowledge. It was engraved by John Walker of J. and C. Walker. Rumsey 0890.128. Phillips (Atlases) 794.